Ideally located half a block from Duval Street in the heart of Old Town Key West, the Old Town Manor, formerly known as the Eaton Lodge, is charming bed and breakfast with a fantastic downtown location that offers comfortable accommodations, modern amenities, fine dining, and a beautiful venue for private weddings. Built in 1886, the Old Town Manor exudes a timeless charm with original cypress doors and shaded verandahs, beautifully appointed and naturally lit guest rooms with four-poster beds and chic décor, and modern amenities such as keyless entry and complimentary wireless Internet. Surrounded by lush tropical gardens, the gorgeous guest house is ideally situated for enjoying all the local attractions such as Mallory Square, Sloppy Joe’s, and Margaritaville, and has been ranked as one of the best wedding venues in the Key West. Located in historic Old Town Key West, the Old Town Manor is home to one of Key West’s oldest gardens, which makes a perfect venue for romantic wedding ceremonies and elegant receptions. The manor can accommodate up to 75 people for a rehearsal dinner, service and reception in the beautiful gardens around the hotel. The Old Town Manor offers a variety of standard packages for all budgets, including bar packages, however, all packages can be customized according to client’s requirements. Packages include standard services such as the use of the garden for several hours (dependent on the package type), tables, chairs, overhead lighting, water station, a licensed officiant, and a state-of-the-art sound system. Also included are the set-up and clean-up of the venue, a dedicated venue coordinator to handle all the details on the day of the event, delivery of gift bags, and a professional bartender (with bar package). The bridal couple gets a multi-night stay at the Old Town Manor, complete with a complimentary breakfast every morning, a bottle of Champagne, fresh flowers, a couple’s massage, and vouchers for dinner for two or a sunset cruise. The manor can be booked as a whole for a large wedding, which includes accommodations for all the guests, as well as complimentary breakfast, concierge services and delivery of gift bags. Overflow of guests can stay the property’s sister properties of Rose Lane Villas, and William Skelton House. The Old Town Manor offers a list of preferred vendors for services, which are not included in any of the packages, such as such as floral arrangements, DJ services, music and entertainment, photography and videography services, wedding cakes, officiants, and limousine, shuttle and valet services. 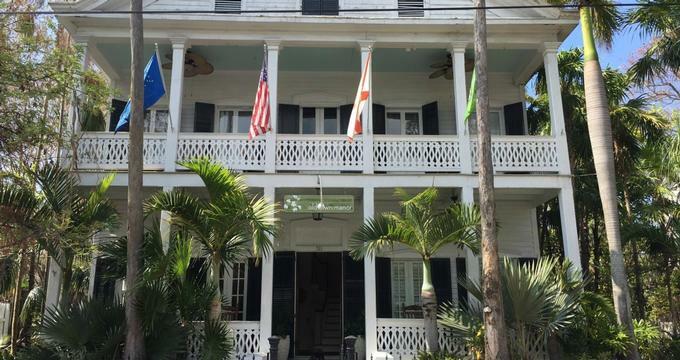 The Old Town Manor is located at 511 Eaton Street in Key West, is wheelchair accessible and offers limited parking for guests on a first-come, first-serve basis.